Whenever we are at a banquet or wedding or event with a bar, my kids are always asking for a kiddie cocktail. It's just lemon-lime soda and grenadine syrup or cherry juice. When I ran into the liquor store recently to pick up some beer for a barbecue, I spotted the little vodka bottles on the counter and the cherry vodka made me think of kiddie cocktails. 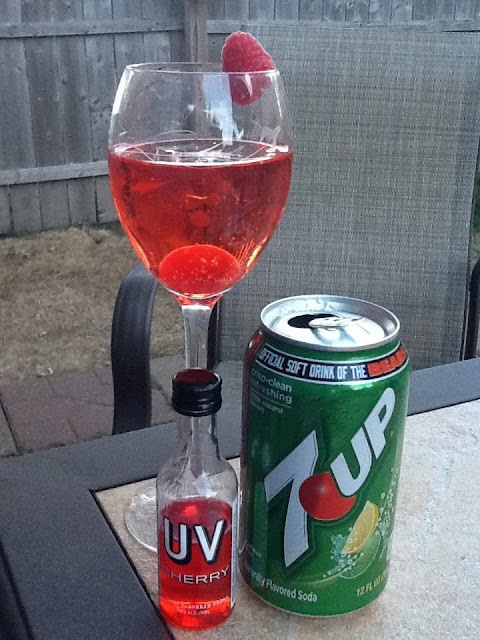 So, I thought I'd make up a kiddie cocktail of my own. :) It's a kiddie cocktail with a kick.